A man leaves or rather flees from a wife who holds him back by his cloak. The woman is sitting or lying in a big bed; she is often undressed and tries to seduce a young man who runs away. 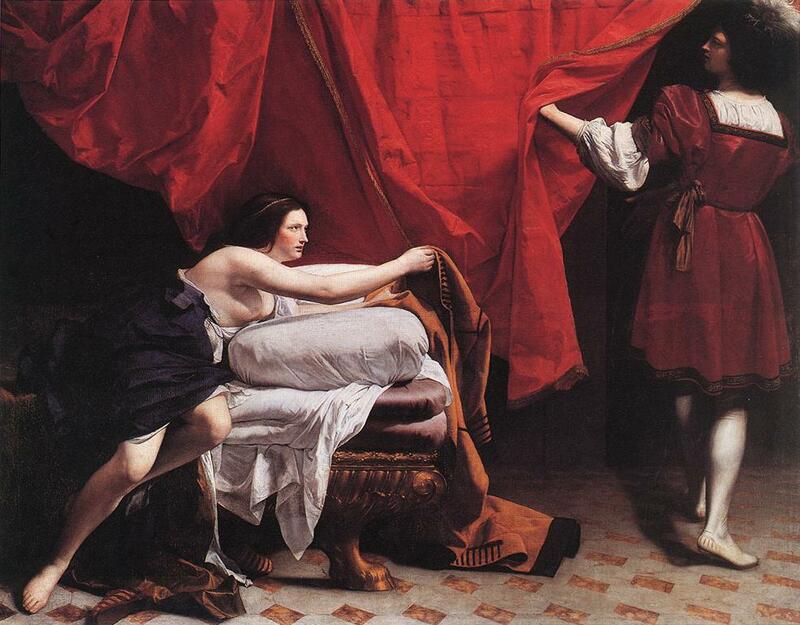 But he leaves his cloak because the woman seizes it at the last moment. The representations are quite varied according to whether the emphasis is put on the woman’s desire, Joseph’s honesty or the Egyptian context. The young man is Joseph; Jacob and Rachel’s son, who has been sold by his brothers as a slave in Egypt. After many setbacks, he is employed at the house of one of Pharaoh’s officers, named Potiphar, and he has become his right-hand man. But the officer’s wife desires Joseph and, one day, asks him to sleep with her. He runs away but the garment she has seized will lose him. Accused by the wife, he is sent to jail. Joseph, Jacob’s last son, has been sold as a slave in Egypt but he becomes the right-hand man of an important person, Potiphar. And it came to pass after these things, that his master's wife cast her eyes on Joseph; and she said, Lie with me. But he refused, and said to his master's wife, Look, my master does not know what is with me in the house, and he has committed all that he has to my hand; There is no one greater in this house than I; neither has he kept back any thing from me but you, because you are his wife: how then can I do this great wickedness, and sin against God? And it came to pass, as she spoke to Joseph day by day, that he did not listen to her, to lie by her, or to be with her. 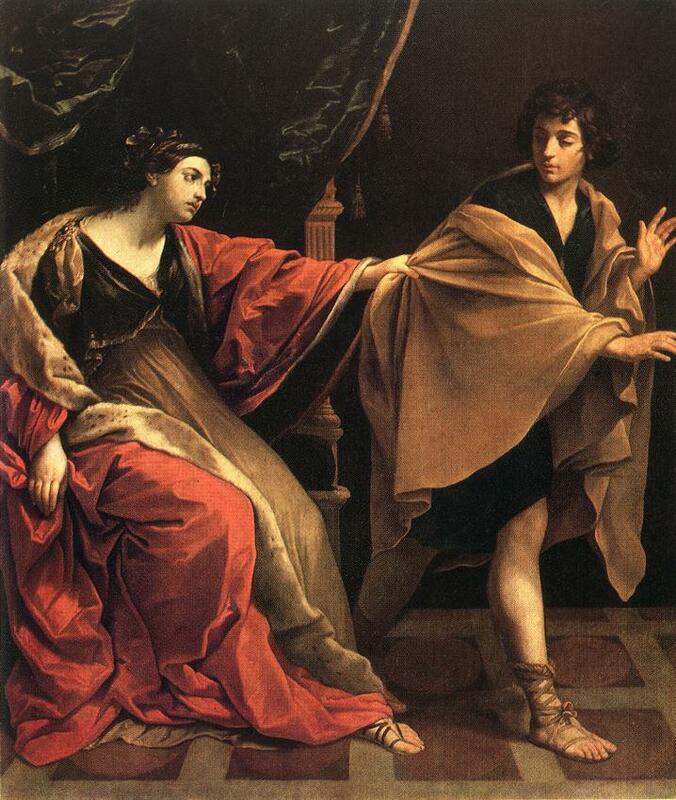 The desire of Potiphar’s wife is more or less expressed; Joseph runs away or simply leaves her but the cloak is always the exhibit. 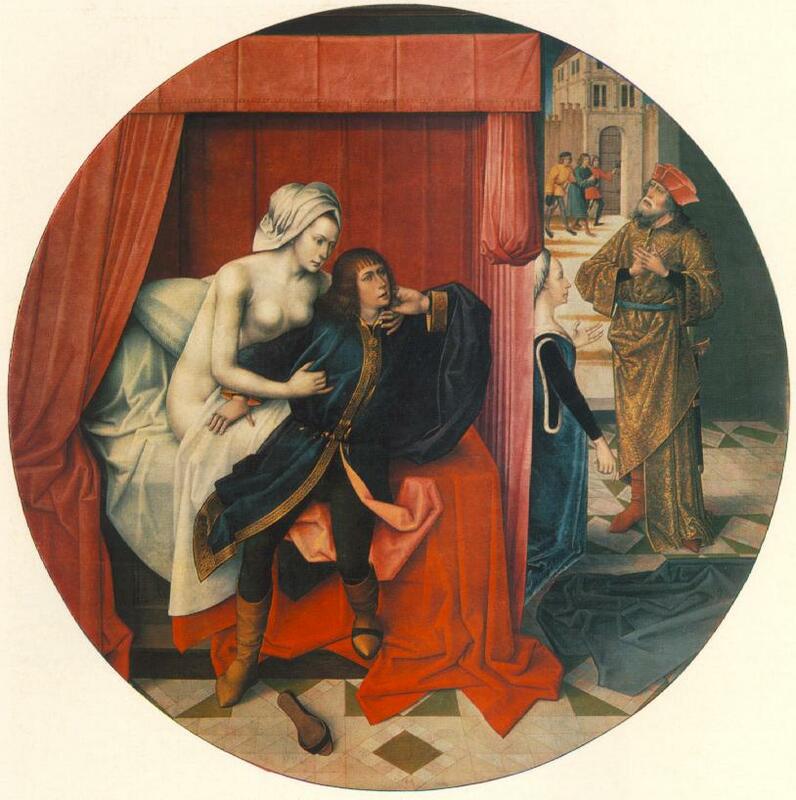 Joseph and Potiphar’s Wife; Master of Joseph’s legend; oil on canvas; Alte Pinakothek, Munich.